Hamsters remain another pleasant pet to keep at home but the idea has not reached many pet keepers. Apart from playing with the hamster, you’ll love watching these wonderful rodents playing their games. Unlike dogs and cats that can get creative and play with anything around them, hamsters can only play with the toys that you provide in their cages. No need to worry because all their toys are available in the market and at the price that you can afford. 1 Why it is important to buy hamster toys for your furry pet? 12.1 Q: How often should I play with my hamster? 12.2 Q: How often should we exchange the chews our hamsters eat? 12.3 Q: Why is it necessary to feed my hamster using Chew toys? 12.4 Q: How do we make homemade hamster toys? 12.5 Q: What kind of toys do hamsters play with? Why it is important to buy hamster toys for your furry pet? 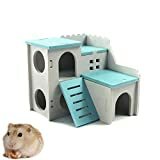 Many hamsters keepers do not consider buying toys for their pets being basic thus ignoring the idea altogether or just purchasing very few toys. Just try to imagine staying indoors with no entertainment and having your doors locked! Does it bring fun or boredom? Hamsters do not go for walks like other pets so playing with the toys their main recreation activity. Hamsters are not sociable like other pets so provide with hamster toys for their fun. Its nice watching hamsters play and making video compilations of the pet having the world of their own with hamster toys. Hamsters live in cages where they cannot find something else to play with. Hamster toys are cheap and convenient. The toys meet safety standards thus cannot endanger the lives of your lovely hamster. Necessary especially when your hamster does not have his playing partner. You must take care of the hamster to have fun with them. Hamsters are very specific to the games that they play so we won’t have several categories of hamster toys. It’s worth noting that hamsters like to; hide, swing, play puzzle, run and to chew. Hamster toys are designed to fulfill the desires of the pet. This is the playground that makes hamsters happy and fully entertained. The small playground is made in a way that it can expand thus offering the pets an ample space to play. This ground is also interconnected with paths thus helping pet complete their favorite puzzle games. Most hamster playground puzzles are made of plastic material to ensure the toys last for long. These are the balls that enable hamsters to make some short runs within their playing units. An exercise ball should have a diameter of about 5 inches for Syrian Hamsters while other dwarf hamster breeds should have much smaller balls. 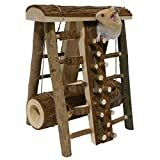 These ladders are mainly wooden and you need to mount the ladders on the cage using bars so that the hamster toys don’t fall on your pets. There are multiple possibilities of mounting the ladders given that they can go either horizontally or even vertically. To enhance maximum entertainment to your pets, the ladder should bear various conspicuous colors. The best way to keep the teeth of your hamster from outgrowing its mouth is by letting it have a chewing exercise as much as it can. The chews are mainly wooden and include; wooden block, wooden ball, wooden wheels, and wooden logs. The chews are usually fixed on the roof of the cage to enable hamsters to devour the chews while standing. The chews come mainly in blue, purple and yellow colors. This makes many of you wonder how a house can be a hamster toy and why a house should be placed in the cage. The house toys give your hamsters an opportunity to hide after making several runs. 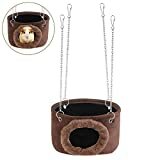 Just the same way you can buy a swing for your kids; your playful hamsters equally need a swing for entertainment purpose. The swings always have wooden seats that allow hamsters to further their chewing habits. The wooden swing hamster toys are attached to the roof of the cage via thin metal chains. Apart from hamster foods, these toys help to have fun for the hamster. Can the material in use be chewed? The comfort of your hamster. The cost of the hamster toy. The color is very important. Sizes of the hamsters you keep. 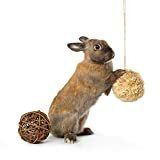 As your trusted pet issues partner, we have a task to help you in selecting the best hamster toys in the market especially where all toys sell. Are you wondering why the name rat is featuring yet our focus is on hamster toys? It’s important to acknowledge the fact that both rats and hamsters share many features as they are both rodents. The same fact makes it easy for the two pets to share even playthings. As already mentioned, chews are very necessary for hamsters in ensuring that your pets exercise and stay with the right sizes of teeth. These chews are attached to the roof of the cage via a disposable hook making hamsters hang the way they could’ve done in the natural habitat. Arrives in two different packages; one package or 2 packages. It’s composed of wooden materials including; wooden blocks, wooden cheese wedge, wood logs, and wood balls. The wooden materials are arranged in a desirable fashion that bears different admirable colors. There’s a disposable hook for attachment on the rafter of the cage. Always get rid of the metal hook after the hamsters have consumed all the chews. Composed of 10 essential Chew substances that make your pets healthy and at the same time maximize their fun. The items come in color; purple, pink, yellow and red. Dimensions: 6.5 by 2.1 by 1.2 inches. 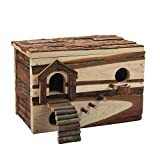 By now you have established that all hamster toy houses have the hideout feature and this wooden house won’t be an exception. The beautiful house is meticulously designed with large windows and several rooms to bring more fun to your shy friend. 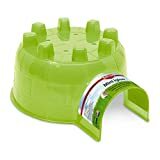 Pet food basin for feeding. Easy to assemble by just joining the plates with teeth together. Resistant to odor hence fresh for your pet to stay inside. A spacious balcony for lookout when the pet is done with hiding and chewing. Made of wooden materials and plastic plates that ensure durability. Easy to fold hence saving spaces when needed. Dimensions: 1 by 1 by 1 inch. Are you tired of seeing the teeth of your lovely pet keep faster and longer than expected? The wait should end with these chew sticks. The stick may look ordinary and something that you can just do for your pet but you are likely to fail in meeting the safety standard. 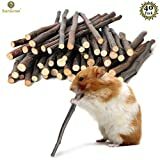 The sticks are all you need to help improve the appetite level of your hamster because upon chewing the sticks, your pet will be drawn to sweet aroma. Besides, chew sticks keep pets busy and less bored. Apart from the sticks, hamsters like to play with bunches and twigs of these plants. Each stick measures about 6 inches in length and is necessary for your pet’s diet for the promotion of growth of healthy teeth. The sticks are equally helpful in diverting the attention of the pets from chewing cages and destroying your furniture. Twigs are a source of roughages thus encourages healthy digestion. Sticks make you hamster’s ever-occupied hence lowering stress and boredom. Safe for use since dyes, chemicals, and paints are not involved. Read More to get clear about hamster food queries and problems. How about going to Amazon market and paying once but getting 5 items in a single product? That’s exactly what happens here where you get several toys upon buy just a pack. Mind you! Your pets won’t realize that you have used so little to get almost everything for them. From the look of things, some of these toys would make someone who is ignorant about pets to think that you’re setting a gym center with wooden training items. They could just be right because your pets will surely lift the toys as they exercise. When the 5 toys are spread within the cage, hamsters learn and master their environment. Five different toys in one pack guarantee your real fun and unending entertainment. The wooden toys promise great chewing moment’s hence well-grinded teeth of your lovely pets. Also ideal for other small pets like; guinea pigs, chinchillas, and mice. The pack contains the following toys; a small bell roller, a bark watermelon ball, a larger bell roller, a small unicycle, and a small dumbbell. Dimensions: 2.8 by 2.8 by 2.8 inches. So you thought that only the Eskimos of Tundra cold desert live in igloos! Your prettiest tiny friend also has a playing unit called Igloo which isn’t situated in the zones with ice. The similarity that both hamsters and Eskimos share is that they’re both smaller. History and Geography aside, this hamster toy comes in various packages and colors hence can satisfy all hamster keepers no matter the number of pets they keep. Besides, the package that the toy comes with can cater for hamsters of various sizes and breeds. The toys have numerous packages including; Mini, Large, Large-2 Pack, Mini-3 Pack, Giant, and Itty-Bitty. Comes in many colors like; blue, purple and green. Each hamster toy has one entry point. The plastic material is strong thus durable. The plastic is equally easy to clean since it resists stains. The hamster toy allows your pets to practice the natural nesting. Also suitable for other smaller pets like; rats, gerbils, and mice. Dimensions: 7.9 by 6.5 by 3.6 inches. Here is another hamster toy that’s designed to grant your pet both luxury and safety. There’s also an attempt to give an appetite for a natural habitat that doesn’t have preys. While this can look like other ordinary homemade hamster toys, perfection cannot be achieved unless it’s manufactured at a company. If you have a shy hamster that likes to hide; this toy is for you. However, with this amazing look, always keep watch because your young daughter could take the house and make it her own toy leaving hamster a homeless pet. Made in such a way that it encourages nesting. Two-layered wood makes the toy durable. The feeding trough is just built outside hence keeping interior sections tidy. The perfect toy for hideouts especially for smaller pets. It’s all made of wooden material to meet safety standards. The wooden materials increase chewing instinct in your pet. It’s safe to say that the house is another hamster chew toy. Fully assembled thus making it portable. Can be folded to provide more space for other toys. The pine wood used in non-toxic but has a natural fragrance. Well-ventilated for fresh air supply. Dimensions: 7 by 3.5 by 7.5 inches. Rating: 4.5 out of 5-star rating. The cozy beds that hang on the raft of the cage is an ideal place for your pet to rest and swing after a tiring run. The toy has clip chains to help hang it on the roof with ease. Still, there’s a large façade from which a hamster can sit comfortably when done with the hiding business. The toy is very versatile therefore can be used with other smaller pets including; squirrels, chinchilla, mice, and rats. The supple material used gives it a soft texture thus making it comfortable for your furry friend. Versatile so its use is not only restricted on hamsters alone but also other small pets. The clip chains are removable thereby allowing easy portability. All the 4 clip chains have high resistance to corrosion thus ensuring longevity. Made in such a way that both your pet utilizes with ease. The Frim structure has a wonderful structure for durability and for aesthetic value. Dimensions: 9.9 by 5.7 by 1.3 inches. Forget about the London Bridge for humans, Rosewood has designed such a beautiful and colorful bridge that must be pleasant the eyes of your pet. The bridge is ideal for resting and watching the things that surround the pet. Promotes a fun and a colorful proceeding for your pets. Encourages hamsters to come beneath the bridge and begin the chewing exercise. The pet can sleep under the bridge as a slight hideout. Wooden materials in use make it safe for your hamsters. Can last for a while. Product Dimensions: 3.2 by 2.8 by 5.5 inches. Some pet owners have already started asking themselves how a flying toy is finding itself among wingless pets. Don’t be alarmed because humans too use airplane despite lacking wings. Let’s be clear here first before we learn more details in the feature’s column. The hamster toy won’t fly with your pet. The center is placed in a good way that it cannot hurt your pet’s tail and toes. Encourages hamsters to exercise more hence a happier and healthier life for your pet. Made in a design that looks pretty much like a cooling fan on an office desk. Designed to maintain silence during operations. Dimensions: 4.4 by 7 by 7 inches. Looks like your pet wants to do some interior design for in its cage! The toy appears well like the wall-Units we have in our living room and from the first look, you can command your carpenter to make a bigger one for your own use. The good designing hasn’t reduced its efficiency because the toy can provide more than five activities to your ever-playing pet. Made of natural wood with a nice fragrance. Activates your pet to play thus lowering boredom. Encourages hamsters to chew hence maintaining the good size of the teeth. Comes along with the non-toxic glue for assembling. The lower part has a log with a tunnel that hamsters like for racing and hiding. Easy to fold hence portable and space-saving. Dimensions: 8.3 by 9.4 by 10.6 inches. Were you thinking that this was a Bee-Hive until you saw the staircase? Well, it looks you can make one for yourself but you won’t achieve perfectness nor will your toy meet the required safety standards. Because hamsters are nocturnal pets, this hamster toy can make it look like it’s already dark even at day time for the fun of your pet. Inside the toy, the shy hamster will feel well-hidden form from domestic predators and other discomforts. Fully wooden to improve the chewing instinct of your pet. Removable when you want to allow shine light in. The wood in use is free from toxic additives thereby posing no health risk. The ladder at the upper entrance is designed to give full luxury. The game room has a dual layer consisting of 8 rooms. 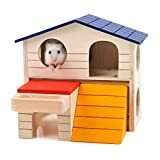 Each of the eight rooms is connected by a ladder thus fulfilling the exploration ambition in your pet. The wooden material is easy to clean. Ideal hiding location for hamsters and other small pets. There’s a Food Basket if the rodent follows the Rock climbing stair. Dimensions: 7.5 by 11 by 7.9 inches. From its appearance, we can pretty much agree that weaver birds can make toys and make real money at Amazon. The only thing that the creative birds missed in this toy is the lack of multiple entries. The neatly hand-woven hamster toy has several doorways that allow your make as many puzzles as they so wish. The material used in weaving the toy provides your pet with what could appear as a burrow in the natural habitat. In a toy market that’s full of synthetic materials, it’s a big relieve to find a toy that has no unnatural material. This feature makes Hideaway Grass Tunnel ideal for chewing hence aiding in blunting the teeth of your pet that quickly grows. 100% made of grass hence giving your pet the nostalgic wildlife instinct. The toy is hand-made by craftsmen thus making it safe for your pets. It can equally serve other pets such as gerbil and mice. There are several doorways through which the pet can escape while playing. It’s placed lying horizontally to expose more entry and exit options for the hamster. Dimensions: 7.5 by 3.8 by 3.8 inches. What an amazing piece of craft for the manufacturers of the hamster toy? Never be jealous with your pet now that he’s almost going own a two-story building before you acquire one. A tunnel between the two mansions for the hamster to race well. Dark interior pleases the nocturnal pet. Entire wooden structure to chew. A silent house is to the chagrin of the pet that hates noises. Whatever is good for hamsters is also nice to mice. Several sections of the story building just increase the puzzles. Dimensions: 18.5 by 9.5 by 8.7 inches. Rating: 4.1 star-rating out of 5. Hamsters take long to get used to their owners and before that bond comes in, the pets are shy and always want to hide. If you corner a hamster and it doesn’t want you to hold it, it will lie flat on the ground. 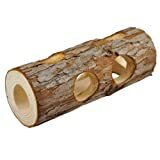 Here’s a natural toy that helps your pet to chew often, make puzzles and hide. The chew toy just resembles the burrows in a hamster’s natural habitat. Natural log with a large hollow drilled from one end to the other end. Several other holes on the sides of the log. The 9 entrances/exits are ideal for the luxuries of smaller pets like; hamsters and mice. The long hollow encourages pets to enjoy making runs. 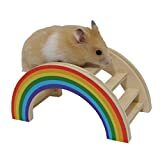 Several entrances/exits allow hamsters to formulate more puzzles while playing. Thick layer between the layers assures you of durability. Dimensions: 7.9 by 2.8 by 2.8 inches. The hamster toy is designed in a way that promotes the interaction between you and the pet. It’s possible to greet your furry friend from one end to the other end. While the greeting is going on, the pet exercises inside the tunnel. Resurrects the hamster’s natural tunneling instinct. Made of the plastic that can expand up to 39 inches thus creating more playing room for your pet. The plastic also contracts to save space. The plastic is stain-resistant thus durable. Also ideals for ferrets and rats. Comes in the purple color. Ratings: 4.5 out of 5-star rating. It’s clear that you’ve begun worrying how a manufacturing firm in its own wisdom can decide to make such a huge ball for a tiny pet like a hamster. Let’s face it! Without much doubt, Kaytee firm has become one of the dominant hamster toy makers with several toys in the market. Believe it or Not! The ball might look as big as it occurs but you can trust that even a dwarf hamster can handle it. This is the ball that you need to buy the attention of your hamster at the time when you’re busy doing other house chores. 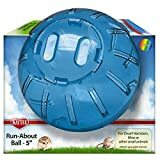 The Mini-Run hamster toy is not only meant for a hamster but can serve other small pets like mice. The best thing with this toy is that it promotes healthy training of your furry friend in a secure way. The toy offers the biggest opportunity of interaction between the hamster and its owner. Exist both as new and used in Amazon market so you can pick the one that satisfies you. A Spherical large ball with rainbow color markings that adds its attractiveness. Comes in a standard packaging thus making it very portable. The diameter of the ball is 5 inches long. Restricts and controls the movement of the hamster but in a spacious location. Dimensions: 4.8 by 4.8 by 4.8 inches. These are the hamster needs you need to fulfill to keep them playful ever. 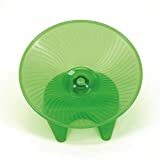 Most hamster keepers may miss all other hamster toys but it’s difficult to find a pet owner who lacks a wheel runner for their pets. Because it uses batteries to revolve around, it presents some hazards hence not suitable for kids below 3 years. After the hamsters have done enough of the exercise and have run out of energy but they still desire movements, hamsters get into the revolving wheel and lazily sit as the fun goes on and on. One large wheel fixed on a revolving axle. The wheel has enough space for entry and exiting the ride. The toy is dangerous to children below the age of 3. Requires 2 ‘AAA’ Alkaline batteries which the hamster toy doesn’t come with. Dimensions: 6.5 by 4 by 6.5 inches. For the past two decades, you have known Exotic Nutrition as one of the topmost manufacturers of nearly all pet feeds but now they’re transferring that reputation on pets’ fun sections. Just the same way Exotic Nutrition has been versatile in providing all pets with food; they seem ready to give all pets that use wheels an Exercise Wheel. It’s, therefore, necessary that choose the right size of the wheel for the hamsters. The manufacturer also makes larger wheels that are big enough to accommodate pets as big as; Chinchillas, Hedgehogs and Sugar gliders. Always be careful never to pick an oversize wheel as a toy for your hamster. 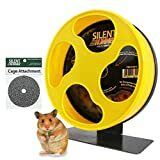 Silent Runner 9” is suitable for your hamsters. It also matches gerbils and mice. Safe to use as it doesn’t have the center axle that often causes spinal injuries and entanglement of the pet. Solid black walls that the nocturnal pet prefers. The running surface is safe as it doesn’t have pinches. Attachment section to the lower parts of the cage. The running track has an additional safety measure with the non-slip perfect grip that prevents the hamster from falling during the ride. The ball-bearing technology permits the wheel to move smoothly without any noise. The shipping of this hamster toy is swift almost in every corner of the world. Dimensions: 9.9 by 9 by 5.6 inches. Read More: for the hamster food queries. The cure to the boredom that a hamster may experience is finally here. 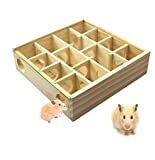 The wood maze helps a hamster to create several puzzles in its play thus improving fun for your pet. The materials in use guarantee safety since the said materials are natural but non-toxic. The maze has 13 compartments with a total of 16 holes that encourage the pet to play more and more. The buyers are advised to be keen never to purchase a maze with holes that have above/below 1.5 inches diameter. The natural wood and the acrylic glass material on the surface are strong enough to guarantee a long life. Besides, the natural wood and acrylic glass materials are of top quality and non-toxic. The maze is designed to have 13 compartments and 16 exits/entrances. Each entrance/exit has a 1.5-Inches diameter. Equally good for other furry pets like mice and gerbils. It’s one of those hamster toys that can be homemade if you’re a craftsman. Comes in two main packages including; 1* Hamster Labyrinth and 1*Acrylic cover. Dimensions: 25 cm by 25 cm by 7 cm. Entrance hole: 1.5 inches diameter. World Cup comes after every four years but you never want to organize a game for your hamster. Put it upon you and buy a natural ball so that you can watch a match that has no referee. The ball is cool because it promotes playing and at the same time encourages better nutrition. In addition, the natural balls ensure that boredom diminishes in your pet. Naturally made just by the hand of humans. Hamsters chew, nudge and nibble the toys to make boredom disappear. The absence of colors, preservatives, dyes, and pesticides makes the toy safe for your pet. Comes in a Kit that holds a cornball and a willow ball. Each of the two balls has a 4-inches diameter. Ideal for both outside and inside the cage. Rating: 5 out of 5-star rating. A: Just like other pets and our babies, hamsters need our attention and they won’t hesitate to show that they need us in their special way. It’s therefore very necessary to make time for our little furry friends when they give us signals. On the amount of time that we need to allocate for a hamster, there should never be a time restriction for your pets. We insist that there should be no minimum/maximum time. Read More: You can come to know easily when your hamster gets sick. Q: How often should we exchange the chews our hamsters eat? A: Hamsters tend to eat their chewing toys a lot of times making the toys becomes damp thereby attracting bacteria which eventual cause infections. To prevent this, you need to change the chewing toys at least once a month. Alternatively, you can change the chewing toys immediately you see your pets have started ignoring the toys. Never wait until the chew toys are over because you may encourage unhealthy eating habits in your pets where they only eat on a single diet. Q: When is the right time to play with a hamster? A: It’s important to acknowledge that hamsters are nocturnal animals that are mainly active at night so the best time to play with them is at night. Never force a hamster to bite you by waking it up when asleep just to play with it. However, you can join it in playing even at day time when you find it awake. Q: Why is it necessary to feed my hamster using Chew toys? A: Chew toys are rich in roughages thus helps in digestion in hamsters just like in you. Secondly, chew toys help in grinding hamsters’ teeth to be uniform. Remember, the teeth are the hamster’s weapons and when left to overgrow, it can attack you with them if you corner your pretty pet. Lastly, lack of chew toys makes your hamster begin eating the furniture, wires and even its own cage. Q: How do we make homemade hamster toys? A: This question requires us to talk about how to make the entire hamster toys in Amazon market so it can be long if we answer by giving steps of every toy. We encourage pet owner to buy toys for their pets unless they are sure that whatever they make at home meet the safety standard and cannot harm their pets in any way. However, some chews that have ready material can just be made at home with natural materials which are free from any contamination. Q: What kind of toys do hamsters play with? A: As you have already learned, hamsters are very playful pets but you need to understand their instinct and habitat to give them the right toys. 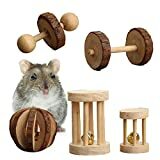 We have discussed most of the best hamster toys in the above review and what you need to do is to provide the toys in their rightful sizes. Because all the 20 hamster toys we have reviewed above are top class, we are not going to give our pick among the best of the best. We urge you to follow the links we have provided to see more features before deciding on which hamster toy to buy. We have deliberately omitted the prices of all the toys because prices change with time. We can no longer continue underestimating the benefits of acquiring hamster toys for our pets. It’s clear that hamsters’ instincts cannot allow the pet to live without these wonderful toys unless you want to give your furry friend a fatal punishment. 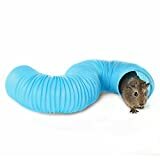 In this article, we’ve identified top hamster toys in Amazon market and we have reviewed them appropriately to ease your selection dilemma. All the hamster toys here have passed the safety test and they all bring immense benefits to your lovely pet. In addition, we have featured a few FAQ that most hamster owners often ask about hamster toys. Please, never hesitate to ask any question concerning pets because our experienced experts are more than ready to help you.